ALBANY—McNary (5-2) earned a much-needed league win, defeating West Albany 16-8 on Thursday, Oct. 12. McNary was less than three minutes away from getting its first shutout of the season as a West Albany receiver got behind the Celtic defense for a 52-yard touchdown with just 2:22 remaining. “We just had a break down one play and they made a good play,” Auvinen said. The Bulldogs then converted the two-point try to get within one score. However, McNary junior Noah Bach recovered an onside kick and Junior Walling was able to run out the clock on three runs for 13 yards. The Celtics got the ball first at West Albany and marched down to the Bulldog 6-yard line. However, an illegal procedure penalty and quarterback sack forced a fourth-and-long and Jacob Jackson missed a 34-yard field goal. 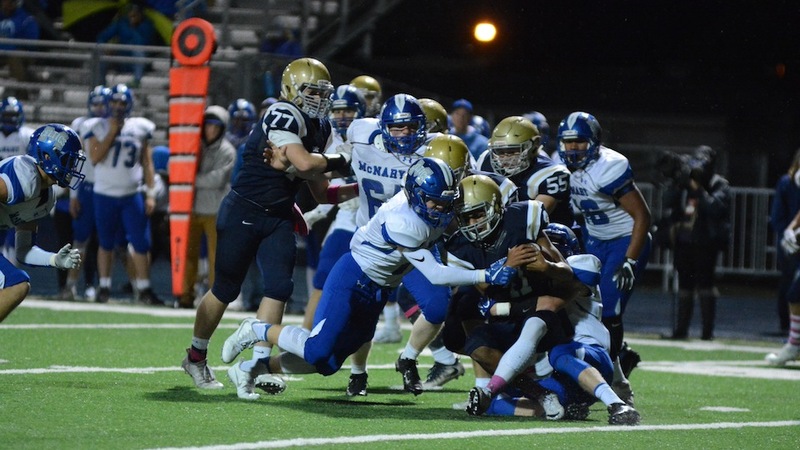 West Albany got into McNary territory but the drive ended when defensive back Jose Solorio intercepted Bulldogs quarterback Nick Fleetwood and the Celtics took over at their own 17. After three consecutive punts, two by McNary and one from West Albany, the Celtics got on the scoreboard when the Bulldogs fumbled and jumped on the ball in the end zone for a safety. Facing a third-and-long after a holding penalty, Erik Barker connected with Walling on a wheel route down the McNary sideline for a 19-yard touchdown to put the Celtics on top 9-0 with 7:37 remaining in the first half. Looking to answer, West Albany got to McNary’s 13-yard line. However, a holding penalty and sack by Bach forced a punt. Barker then completed six consecutive passes for 60 yards on the following drive before getting sacked and then throwing an interception with just 16 seconds to go in the first half. After McNary’s defense forced a quick punt to start the third quarter, Barker completed a 19-yard pass to Jackson to get the Celtics inside the West Albany 15-yard line. On fourth-and-inches from the 4-yard line, Brayden Ebbs gained two yards and Walling finished the drive with a 1-yard touchdown run to extend the lead to 16-0 with 7:11 remaining in the third quarter. When a penalty gave West Albany starting field position inside McNary’s 30-yard line, Devyn Shurr intercepted an under-thrown ball early in the fourth quarter. McNary’s defense had allowed just 33 yards through the air until the Bulldogs final possession. West Albany rushed for 134 yards, more than half of which came in the first quarter. “In the first quarter, they were making plays and we weren’t getting off blocks,” Auvinen said. “Then we started getting lower and forced those holds. I think they were holding the whole time but you can’t show the official unless you’re trying to come off that block. I think we played harder that second quarter and forced them to have to do some different things and it helped us quite a bit. With two games to go, Oct. 20 at North Medford and Oct. 27 at home versus West Salem, the Celtics are third in the Greater Valley Conference and 16th in the OSAA power rankings. “I feel like we improved a lot this week and we just need to keep doing that week after week,” McNary senior Jakoby Doke said.